Dynamic Precleaner / Filters For Off-Highway / Industrial Applications and On-Highway Under Hood Applications. 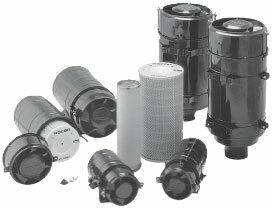 Racor AFCS Standard Air Filters are designed to be connected to the air intake of the gasoline or diesel engine. Racor Combination Dynamic Precleaner / Air Filters are specifically designed to be connected to the air intake of gasoline and diesel engines. The advantages of the systems include their compact size and ease of installation. The three-stage air filtration systems are designed with only one connection to the engine. Their applications include agricultural machinery; earth moving, construction and mining equipment; stationary engines; generator sets; trucks; pick-ups; off-road vehicles; material handling equipment; snow removal equipment and street sweepers.